WRITTEN UNDER RETHEL'S "DEATH, THE FRIEND"
Toll! Is it night, or daylight yet? Though surely now the sun has set. Toll! But who tolls the Bell once more? He must have climbed the parapet. Did I not bar the belfry door? That wont to pray with me of yore? No,—for the monk was not so lean. And tolls a knell.—This shape is Death! Good-bye, old Bell! So let it be. How strangely now I draw my breath! 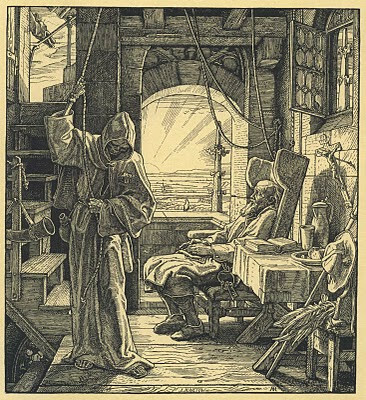 In an old tower just below the belfry, in the place where they ring the bells: there is Death again in his pilgrim's dress, tolling for one who is just dead, the Sacristan of that Church; this Death is draped tenderly down to the feet; there is no maddening horror about him, awe only; he is not grinning as in the other picture, but gazes downward, thoughtfully, almost sadly, thinking of the old man's life that has been. And he, with his hands laid together and his eyes closed, is leaning back in his chair: many a time these latter years has he leant back so; then needs must that he rise stiffly and wearily to go about his duties; but now he need never rise again; his lips, parted a little now, need never again be drawn together close, at sight of weary injustice and wrong; he will soon understand why all these things were. The dragons on the spire eaves lean forward open-mouthed, disappointed because he has got quit of all that now; near the head of him against the wall is a figure of Christ on the Cross, a Bible is open by the side of him; near the stairs is a horn hanging, a huntsman's horn, and through the window, on the sill of which a bird is singing, you can see the fair sunset-country stretching away for leagues and leagues (for we are high up here, just under the spire). They say he was a hunter in the old time, this man; that he heard the north wind sing about his ears, as he dashed over the open spaces; that the young beech-leaves in the early summer quivered at the blasts of his horn; that many a time he rode into that village you can see down there, wherein he was born, where his father and his father's father lived, weary with riding; that some one used to look out for him when he rode in, in the evenings. But that too is all gone by—only in memories perhaps—yet he had other hopes then perhaps than this, a mere old sacristan dying lonely in the old belfry. What matter? for the setting sun is bright over all that country, and the bird sings still in the window sill—not afraid of death. By absolutely perfect wood-engraving, I mean such work as all the sixteenth-century engravings and such as those quite perfect examples in Rethel's Dance of Death and the Friend and Avenger. I don't believe that any attempt to express more than they do could possibly be successful.